Every day has its challenges. In this world it’s easy to loose yourself and what you stand for, it’s easy to be swayed, to compromise morals and question your beliefs and convictions. It starts small….and then next thing you know it, you’ve separated yourself from God’s love, drifted off on your own, serving your own will. It doesn’t take long for idolatry to set in, serving career goals, money, unhealthy foods, gossip. Being immersed in the worlds view of success and happiness, rather than God’s. 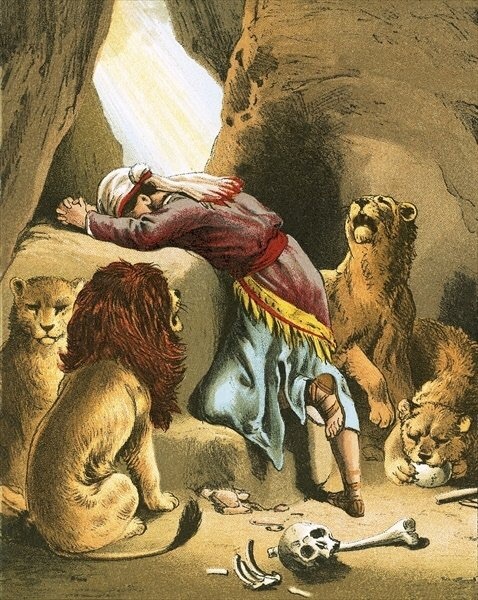 The song, Daniel In The Lion’s Den, by One Drop reminds me to pray for what God’s will is. Just like Daniel, we face hardships, fears that can cause us to question what our faith says, what our inner voice tells us, what God’s word is. In these times it is important to remember that If we stay faithful, God will be with us, protecting us. Daniel 6:23 The king was overjoyed and gave orders to lift Daniel out of the den. And when Daniel was lifted from the den, no wound was found on him, because he had trusted in his God. Daniel did not conform and turn from God, instead he trusted. The consequence for continuing to serve God was death in the lions den. However, Daniel knew his God was greater and trusted God with his life. We serve the King of Kings, Lord of Lords, not man. Our God is greater and stronger than and adversity we face. Best of all, he loves us, all of us. Pray for God’s will, be courageous enough to live it, let His word reveal your purpose. And be prepared for miracles and claim victory over your adversities.